Kavanaugh called Renate (reh-NAH'-tah) Schroeder Dolphin "a good female friend" whom people in his social circle "would admire and went to dances with." He said the yearbook reference "was clumsily intended to show affection and that she was one of us." He says part of the reason for the allegations is anger by some about President Donald Trump and the 2016 election, and out of revenge on "behalf of the Clintons." In the 1990s, Kavanaugh was on the team that investigated President Bill Clinton as part of special prosecutor Kenneth Starr's investigation. The report led to Clinton's impeachment, though he was not removed from office. Melania Trump has not been watching the Senate Judiciary Committee hearing featuring Supreme Court nominee Brett Kavanaugh and Christine Blasey (BLAH'-zee) Ford. Spokeswoman Stephanie Grisham says the first lady and members of her staff have been in meetings all day Thursday about her upcoming trip to Africa. The first lady is scheduled to depart Monday on a weeklong visit to Ghana, Malawi, Kenya and Egypt. Ford has accused Kavanaugh of sexually assaulting her when they were teenagers. Kavanaugh denies Ford's allegation. He has also denied claims of sexual misconduct against him a few other women. Kavanaugh said that he isn't questioning whether Ford was sexually assaulted - but he says he did not do that to her or anyone. He says he's "innocent of this charge." The Senate Judiciary Committee hearing is resuming with Supreme Court nominee Brett Kavanaugh set to testify on allegations he sexually assaulted a girl when both were in high school. Christine Blasey (BLAH'-zee) Ford says she doesn't have any political motivation for coming forward with accusations of sexual assault against Supreme Court nominee Brett Kavanaugh when they were teenagers. 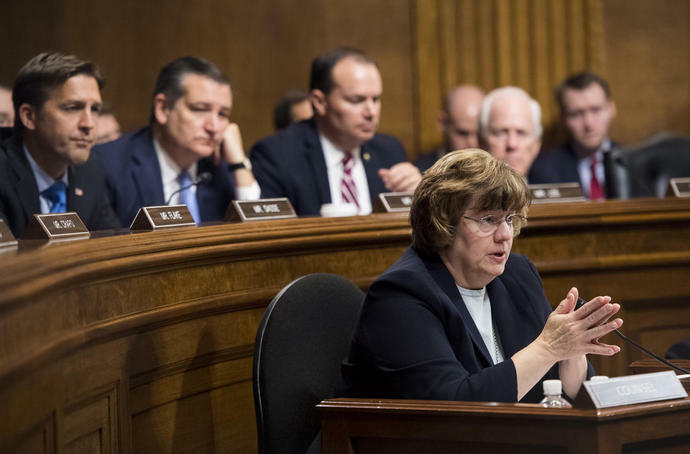 Two Republicans on the Senate Judiciary Committee say allegations made by Christine Blasey (BLAH'-zee) Ford against Supreme Court nominee Brett Kavanaugh haven't been substantiated. Some of the more talkative members of the Senate Judiciary Committee are suddenly quiet after hearing Christine Blasey (BLAH'-zee) Ford testify. Senate Majority Leader Mitch McConnell - who's not on the committee - is ignoring reporters' questions about how the hearing has been going.